To prepare the body for giving birth, and moving the baby through the birth canal, pregnancy hormones work to loosen ligaments and joints in the pelvic area. At times these hormones can start working too fast and too well, leaving you with some interesting feelings and occasional pain in the pelvic area. This is known as symphysis pubic dysfunction. Relaxin is the hormone responsible for the weird feelings and pain associated with symphysis pubic dysfunction. Relaxin works to loosen ligaments and joints in preparation for giving birth. Sometimes relaxin can be overactive or more effective than intended, which causes too much loosening of the pelvis. While pain is associated with symphysis pubic dysfunction for some women, the effect of Relaxin is relatively harmless. Rolling, walking, and standing often leave you feeling like your legs and joints are moving in opposite directions but don't worry, are not going to break or fall off! Pelvic belts, also known as pelvic girdles, are safe to use during pregnancy and are manufactured by a companies specializing in pregnancy support. Kegel exercises and pelvic tilts are also good for strengthening the muscles and ligaments of the pelvis. Prevention is the best treatment, so you should get dressed sitting down and refrain from lifting heavy items. 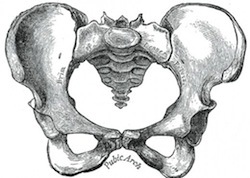 You should remember that Relaxin will ease out of your body after birth, so the symptoms of Symphysis Pubic Dysfunction should ease up as well. In some very rare cases, the symptoms persist after giving birth and medical attention is required.